Today’s post is dedicated to bloggy stuff. First, have you all entered the amazing giveaways that are going on right now? The winners will be drawn on Wednesday, Aug 5 at 10 pm. I say 10 pm because I am fairly confident my son will be in bed at this time. If for any reason he isn’t, I may draw later. Since there are so many entries, I plan to film the drawing (I will be using random.org) and will post the video along with the winner’s comment numbers. Sweet Pea One Size Diaper. Aug 5. A commenter let me know that there wasn’t a way to subscribe by email. When we redesigned a bit that dissapeared! I just signed up for feedburner, and would love to replace the number “5” with a higher number of readers! If you love my blog, sign up to get emails of my posts. Or, use feedburner to get my RSS feed through the reader of your choice. Here is one for So Fawned about how to best begin cloth diapering. Over at New and Green baby Co’s Blog I wrote about my adventures in Elimination Communication, and an overview of what EC means. Recycle Your Day interviewed me for their blog. You can read a bit about why I started DDL, and practicing EC also. Soon I will have a post on Affordable Baby Organic’s Blog about “Organic” Cloth Diapers. So I will add that link when it is up! DDL was also linked in an article on Examiner.com by Amanda Punaro about the Cloth vs. Sposies question. You can read her article here. Would you like to know what is coming up on DDL? Monday Aug 3- Kissaluvs Marvel Review and Coupon Code! Monday Aug 10- Booroi Cover review and Giveaway of a trial package! Monday Aug 17- Sbish Snapless Multi fitted review. Monday Aug 24- Fuzzibunz One Size Review. In September join me for “All About Wool” Week!!! Wool is the final frontier in my cloth diapering adventure. Join me while I figure out what all the hype is about. I will be trying interlock wool, a wrapping wool cover, a knit cover, and a recycled wool cover. I will also explore how to wash and lanolize wool. Will I be a convert? Check back to find out! 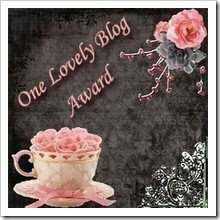 DDL has been awarded two bloggy awards from other blogs. This one comes from Lyndsey at Motherhood Moments. She writes quite often on EC, and she is a Cloth Diapering momma when her little one is wearing one! I need to pass this one on, so here are some other great blogs you should be reading if you like mine. The Eco Chic– A blog with an eco-friendly focus. She redid her site recently and it is much more user friendly! She also has lots of green giveaways! The Cloth Diaper Experiment– Holly has recently started cloth diapering and she is documenting her progress for the world to see. Follow her and find out what works for her, and what doesn’t. Momma-Molly– Molly has some photography skills! I love seeing her pictures of her beautiful family. She is also a green mommy. Sensing a theme? These ladies should tag a few blogs and pass on the bloggy love. 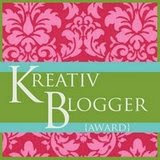 Another award that I have been incredibly slow at passing on is the Kreativ Blogger award. Thanks so much to My Four Monkeys Reviews for passing it on to me. This one has the requirement of saying 7 things I love, and then pass it to 7 more bloggers. My Husband, he cooks too! Taking walks with my son. Getting sleep in more than 3 hour increments. Now, 7 Bloggers who deserve an award. 1. So Fawned. (love the new layout!) 2. Mama Notes 3. Paisley and Pretties 4. Tout-est-des-roses 5. Mama Kenz Studio 6. Yes they are all mine and 7. Better Days Ahead These bloggers should claim their award and pass it on! Lastly, due to the bad press that “mommy bloggers” have been receiving lately, I have added a review policy page. I will never accept payment to review an item. Rest assured, I am giving my unbiased and uninfluenced opinion on whatever item I am reviewing. I don’t think any diaper will get a perfect score, but I will keep hunting for one! I think every diaper has good and bad, and I am here to let potential consumers know what they are buying and if it will work for their child. I hope that everyone enjoys my video reviews because I plan to continue them until I have a vast library of cloth diaper video reviews.